There are only a handful of poisonous mammals in the world, but if you live in the eastern United States, chances are good that one of them, the Short-Tailed Shrew, is on the prowl within a hundred yards of where you sit. The Northern Short-Tailed Shrew and its close cousin, the Southern Short-Tailed Shrew are common throughout the Northeast in almost all habitats, including backyards, but there's no cause to jump up and move to higher ground. Though it is the largest shrew in North America, the Short-Tailed Shrew is still a very small creature, about 4 inches in length including the "short-tail," and weighing less than an ounce. It is slate gray, with short legs and a less pointed nose than most shrews. If you saw one, you might very well mistake it for a mouse. If you mistook it for a mouse, it probably wouldn't cause you any great harm, since no human being has ever been recorded as dying from shrew venom. But if you were an insect or earthworm, or even a mouse, you would be well-advised not to make a mistake about a Short-Tailed Shrew. Shrews in general are among the world's most ferocious and insatiable predators and the Short-Tailed Shrew is no exception. 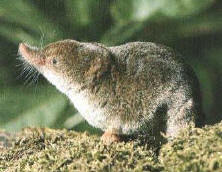 Because of its high metabolism, a Short-Tailed Shrew will often eat its weight or more each day. Kate Doyle, a mammalogist at the University of Massachusetts who has trapped and studied Short-Tailed Shrews says, "We should be glad they're not bigger, because they eat everything!" The Short-Tailed Shrew is a frenetic hunter, active most of the day, searching for prey through leaf litter and in the underground tunnels of voles and moles. Watching it hunt, it's easy to imagine that somewhere a clock is ticking and time is about to run out. In fact, shrews almost constantly are living with time running out. A Short-Tailed Shrew can't go more than a few hours without food before its energy stores are used up and it starves to death. The endless need to eat may be the reason the Short-Tailed Shrew has evolved venom. Not, however, because they need it to kill their prey. Short-Tailed Shrews and other shrews that don't have venom are perfectly capable of killing their prey simply by biting it repeatedly. Something else must be going on. Dr. Kenneth Kardong at Washington State University Pullman, a biologist who studies the evolution of venom, particularly in snakes, points out that use of venom to rapidly kill prey is rare in the world of vertebrates. When I asked him why he thought more mammals hadn't evolved what seems like a good weapon, he suggested most mammals don't need venom. "They have other weapons. Strong jaws, claws, high mobility, etc. Snakes don't have those same weapons. That's why they need venom. For the most part, mammals don't." The salivary secretion the Short-Tailed Shrew works into its bite is chemically similar to that of a cobra. It contains hemotoxins that lower blood pressure and cause circulatory problems, and neurotoxins that cause paralysis. When a cobra uses this type of venom, the object is to kill and kill quickly. The venom used by Short-Tailed Shrews certainly helps them kill prey, but its main purpose may be something else. Shrews in captivity that are fed a large number of insects at once often bite them all, take them back to their nest, and hoard them. The insects are paralyzed, but can remain alive for 3-5 days. This allows a Short-Tailed Shrew to store food for the times when it can't find new prey and its starvation clock is running out. It simply returns to its nest and raids the refrigerator. This may be especially important in winter. Short-Tailed Shrews are active all winter long, and though insects, grubs, and worms are often still plentiful under the ground, they may be less evenly distributed. If a shrew comes across an abundance of prey, it may be advantageous to be able to capture and store that prey alive and paralyzed in case the shrew can't find something to eat later. According to Dr. Joseph Merritt, an expert on the Short-Tailed Shrew who studies winter survival of mammals at the Powdermill Biological Station in Rector, PA, the Short-Tailed Shrew is one of the few mammals that actually gains weight in the winter. With adequate prey, the ability to cache food, and no breeding responsibilities, Short-Tailed Shrews fatten up under the snow and burst into spring ready to mate and breed in late March. As for having these interesting, though poisonous, mammals in your yard, there's little to worry about. Though Short-Tailed Shrews can often be the most common small mammals in this part of the country, even more common than mice or voles, people rarely encounter them and are even more rarely bitten. Short-Tailed Shrews spend most of their time underground, and even if you meet a Short-Tailed Shrew above ground, it'll most likely run away. Dr. Merritt has been bitten several times when handling Short-Tailed Shrews with little more reaction than a bee sting. But he remembers one student who was bitten on the hand by a particularly angry shrew that had to be pried loose. The student's arm became swollen and painful and showed signs of internal bruising that lasted more than a week. So it's wise to be respectful of this tiny, but successful little hunter. Be thankful that their ferocious appetite -- and their venom -- is applied mainly to insects.